Which will simply tell you the distribution of published application sessions for an individual XenApp host. Hope this helps! This post starts with a bit of a mouthful, however if you want to configure your private on-prem vSphere environment with vCloud Connector in order to access vCloud Air Virtual Private Cloud OnDemand resources you’ll need the following information. 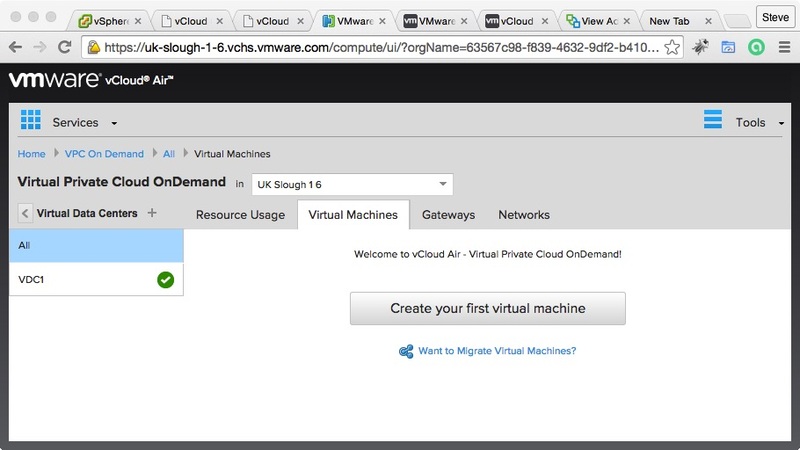 If like me you have a small lab environment which consists of a single vCenter Standard appliance/server and you have access to credit on vCloud Air Virtual Private Cloud OnDemand then you will need to configure something called the vCloud Connector (referred here as the Server, and then the Node). 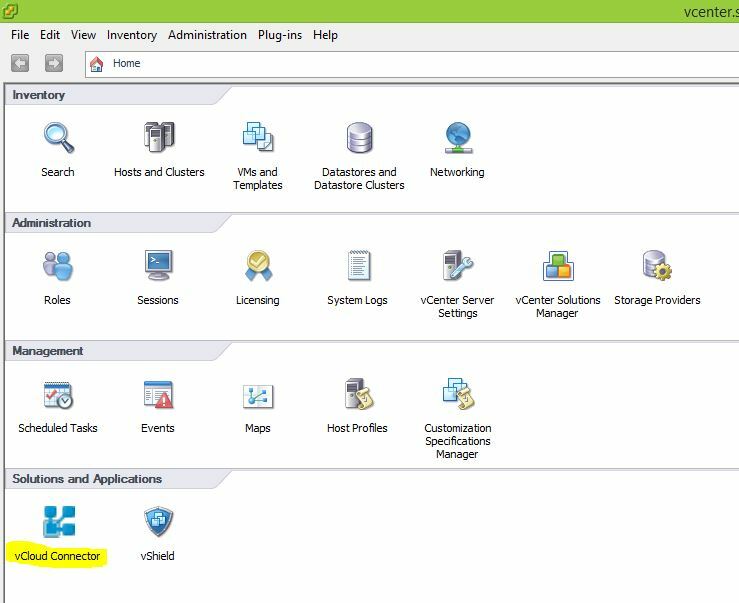 These are two separate appliances which you’ll deploy via a simple OVF template and then link together with your vCenter instance. VMware’s own documentation is pretty straight forward apart from one specific area which I think needs a little improvement. First, download and deploy the vCloud Connector Server appliance, followed by the Node. Both of these steps are detailed here in the product documentation and simply require a static IP address, default gateway, DNS and subnet mask during the template deployment. Once the appliances are online, check that the time zone is correct and in agreement between both appliances. 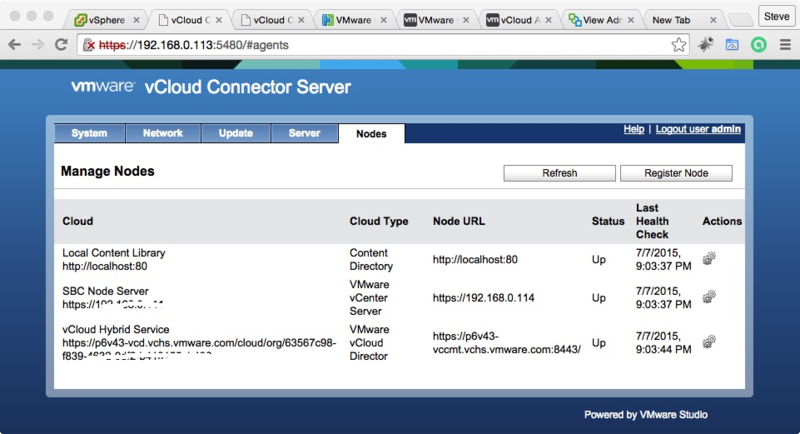 Configure the Node first, by entering your Cloud details which in my use-case is simply the vCenter servers URL. Once this is complete, configure the Server component by registering the Node which you just worked with. 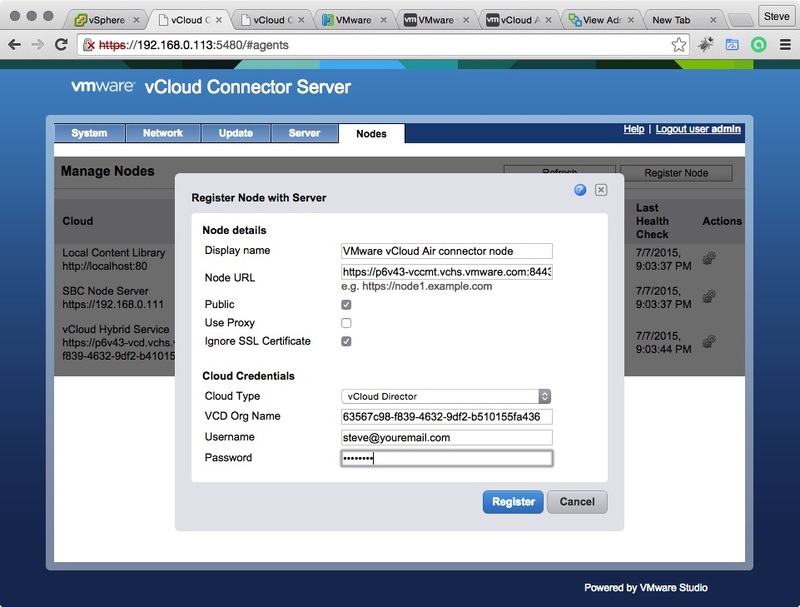 This step links the Node to the Server, and completes the following relationshipPrivate Cloud (vCenter) Node <<—>> Server <—>The vCloud Connector server maintains a local content repository which you can then use to synchronise content between the vCloud Air service and your own content catalogue (think templates). These URLs are different to the ones which you are redirected to if you select “Want to Migrate Virtual machines?” link in vCloud Air and correspond with the On Demand service. vCloud Connector nodes in vCloud Air have SSL enabled and certificates from DigiCert installed. If you want to use the certificate, you must add a DigiCert High Assurance CA-3 intermediate certificate to your vCloud Connector server trusted keystore. Obtain the certificate, then see Add CA Root Certificate to Trusted Keystore for information on uploading it. 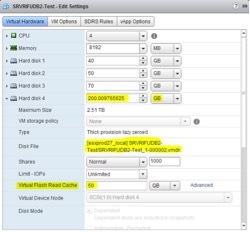 Specify the name of your vCloud Air virtual data center. (This is also the Organization name in the underlying vCloud Director instance.) You must use a valid name. vCloud Connector validates the name that you provide. It would have been nice had VMware provided a bit of a nudge here in terms of the field description, but I suppose its obvious now after going through the process. The two components on the left hand side belong to you and run on your private cloud infrastructure, whilst the right hand side connects you to VMwares cloud platform. Once this is achieved we now have a new icon displayed within the vSphere Client which allows us to access our content library and begin to upload Templates, VMs and vApps to the cloud. Check back for more vCloud fun soon. This post is a slightly different one that I’ve usually made simply because it is more notes based than editorial or comment, however I hope that the simple steps and data captured here will be useful. In fact it’s taken me a while to get this data out, but even though it’s about a year old now the performance improvement should be even better with ESXi 6.x. 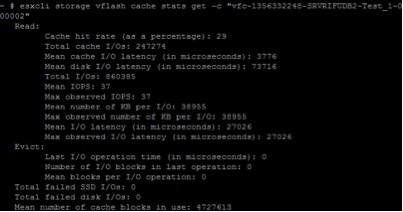 In this test we were interested basically in evaluating whether VMware’s new Flash Read Cache(vFRC) feature released in ESXi 5.5 would benefit read heavy virtual workloads such as Oracle DB. VMware ESXi 5.5 Enterprise Plus license with vFlash Read Cache capability. High and low water disk latency – between 4 and 16ms (using 7.2K RPM drives in 4 disk RAID5 array). Max IOPs were found to lie between 576 and 608 per second using a 200GB VMDK located on the 4 disk RAID array.The high water mark for disk latency rose to 28ms during the test, versus 12ms when the instance was idle – indicating contention on the spindles during read/write activity. During the I/O calibration test the high water mark for disk throughput rose to 76,000 KBps, versus 3,450 KBps when the instance was idle. This shows that the array throughput max is around 74MB/s. Having established that the majority of writes during the above test were in fact using an 8KB block size (not as shown in the screenshot which was taken from a different test (4KB)) the vFRC was enabled only on the 200GB ASM disk using an arbitrary 50GB reservation (25% of total disk size). No reboot was required, VMware inserts the cache in front of the disk storage transparently to the VM. In the example above, no blocks have been evicted from the cache yet meaning that the 50GB cache assigned to this VMDK still offers room for growth. 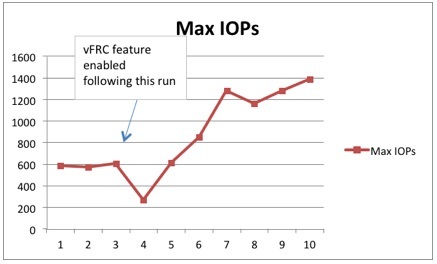 When all of the cache blocks are exhausted the ESXi storage stack will begin to remove older blocks in favour of storing more relevant up to date data.The resulting I/O calibration performance is shown below – both before and after enabling the vFRC feature. 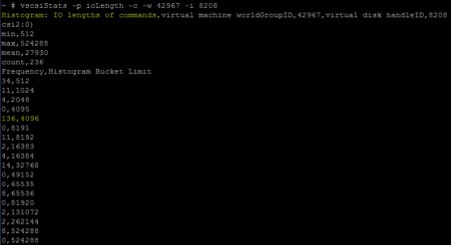 In brief conclusion, the vFlash Read Cache feature is an excellent way to add in-line SSD based read caching for specific virtual machines and volumes. You must enable the option on specific VMs only, and then track their usage and cache effectiveness over time in order to make sure that you have allocated not too much, or not too little cache. 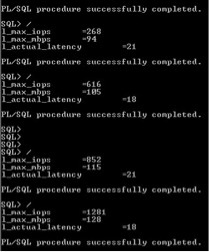 However, once the cache is primed with data there is a marked and positive improvement to the read throughput, and a much reduced number of IOPS needing to be dealt with by the physical storage array. For Oracle servers which are read biased this should significantly improve performance where non-SSD storage arrays are being utilised. Imagine a situation where you want to change your NetScaler Gateway’s logon page to include alternative prompts for the Username, Password 1 and Password 2 fields and need to update the language specific .XML files. This has been documented before, and isn’t too hard to figure out once you’ve found a couple of ‘How to’ guides on the Internet. However I have since come across a limitation in trying to apply the NetScaler’s new ‘Custom’ design template to several different NetScaler Gateway virtual servers at the same time, because essentially whilst you can define your own custom design it is automatically applied to all instances of the virtual server residing on the NetScaler – so if you define custom fields then you’ve defined them for all. This was achieved by editing index.html and login.js files in /var/netscaler/gui/vpn of the NS as per the Citrix article above. In addition, the resources path which holds the language based .XML files in /var/netscaler/gui/vpn/resources has been backed up into /var/customisations so that the /nsconfig/rc.netscaler file can copy them back into the correct location if they get overwritten or lost following reboot. However, because these values apply globally there is an issue if a second NetScaler virtual server does not use a VASCO token as a secondary authentication mechanism. This causes the normal ‘Password’ entry box to be displayed as ‘VASCO token’. The only suitable workaround for this is to create a parallel set of logon files for each additional NS gateway virtual server and use a responder policy on the NS to redirect incoming requests for the index.html page of the VPN to a different file. Edit the indexTrainingNS.html file and make the modifications described in CTX1262067. Now when you launch the URL for the Training NetScaler it will redirect to the custom index.html file and load a separate logon.js and .xml resource files so that the logon box will be name differently. Believe it or not, but it seems that it is possible to crash a clean ESXi 5.5 host right out of the box by installing a Windows Server 2012 R2 virtual machine with an E1000 virtual network adapter and attempting a file copy to another VM located on the same box. I was trying recently to copy some data from a Windows Server 2003 VM onto a new 2012 R2 VM on the same host. Expecting that the file copy should be extremely fast (due to proximity of network traffic on the same switch) I was left scratching my head when I noticed only 3-10MB/s transfer rate. Because I was still running ESXi5.0 I thought it would be better to troubleshoot if I upgraded to the latest version of the hypervisor, only to find that the second I hit ‘paste’ to begin the file transfer the entire hypervisor crashed with a purple screen. Needless to say, this isn’t a fringe case and others would appear to have noticed this behaviour too. The fix is simple enough, just swap out your E1000 vNIC on the 2012 R2 server with a vmxnet3 adaptor, but how is this simple scenario so dangerous that it is able to take out a whole host? Thankfully, after swapping the vNIC I was then able to achieve 50-60MB/s throughput continuously, which was more than enough of an improvement given where I started before. I’m going to link to the original post I found here, but nevertheless I’ll update this page if I find that there is a known issue somewhere that explains how this behaviour has occurred. Dell MEM, EqualLogic and VMware ESXi, how many iSCSI connections? If you run into problems with iSCSI connection count then you will need to rethink which hosts are connecting and how many connections they maintain. Should the /psc URL work on both HA Platform Services nodes?